Dominion! I very much enjoyed this 'base' game when I first played it and would strongly recommend gamers to take a look. It reminds me of Magic the Gathering, adapted to remove the collectible aspect and allow players to buy all the cards they wish during the game. At first, I genuinely felt the system was worth a huge investment of time and energy. But there are some adverse comments on Boardgamegeek, claiming the game is flawed or even broken because buying money is usually the best strategy, by far. After playing a lot, I very reluctantly feel I have to agree. The fundamental problem is that the reliance on buying money does detract from and can relegate the deck building aspect, which should be Dominion's strong point. Then, even if you take into account the money cost of the cards, some buys in the scenarios (i.e. the suggested sets of ten) are much better than others. The cost in coins for the decent cards is too low to give sensible play balance. This means players - who draw from the same card piles - build similar decks. So it ends up being less interesting and stimulating than it could be, and I lowered my rating after several plays. The expansions help to remedy this central fault, but don't filter it out of players' considerations the way they should. The expansions are fun however and I liked the themes in them but it isn't essential to buy more cards beyond this base game. 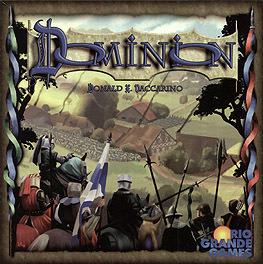 Dominion has a massive following but I think it's quite crucial to stand back a bit from the craze and consider the design with objectivity and proper common sense. After repeated plays, I reckon other deck building games on the market are better and (ironically) give gamers much better gameplay options. Dominion is a great family game that introduces basic strategies to the younger members of the family whilst also satisfying a mixture of strategy types for the more seasoned player. An easy game to learn it is relatively quick with clear goals but a number of strategies can be employed to be the victor. The game itself is a card based game and collection of cards in one�s own �deck� facilitates gaining victory cards (with relevant victory points per card). The winner is the player at the end of the game (when certain card stacks run out) with the most victory points. Simple. Intra-game variability provides a fantastic array of probabilities and possibilities for all to enjoy. Myself I quite enjoy some of the preset card selections (within the instructions) although all give interesting game-play scenarios. I can thoroughly recommend this game as even if you don�t win it is great fun building up your dominion. All ages and up to 4 players, this game is fantastic for the family or just for a quick one or two games in the evening. Cracking. A recent addition to our gaming libary and a very welcome one! A well balanaced card game where no 2 games are the same! Each game consists of building your deck in the early game while hindering opponents before making a dash for victory points in the later rounds! We have now played with the original, intrigue and alchemy. Dominion seems to play more around deck building to win and intrigue seems to play better at stopping/spoiling others decks. Both can be played entirly on there own or mixed for a more varied game. Alchemy is a pure addon and needs one of the other two to play. Price is a fair deal on all sets as well, you get alot of quality cards(that really need card covers as they get shuffled alot) and a special mention should go to the layout in the box, its is well thought out and keeps all the cards seperate, neat and very east to find! Dominion is a card game for 2 to 4 players. Each player is a landowner trying to build up his empire, increasing his wealth and influence along the way. Players start with a meagre treasury and a small amount of land represented by their 10 card starting deck of seven Copper cards and three Estate cards. All of the other cards are placed in stacks in the centre of the table in the �Supply�. The supply consists of a few stacks that begin every game; three Treasure card stacks (Copper, Silver & Gold), three Victory Point stacks (Estate (1VP), Duchy (3VP) & Province (6VP)) and the Curse (-1VP) stack. The other 10 stacks are the Kingdom cards. There are 25 different Kingdom card stacks, and 10 are chosen for each game, either by using the suggested sets from the rule book, selecting the 10 you want to play, or by shuffling the randomizer cards provided and dealing 10 randomly. This gives you more than 3 million combination to play. You start each turn with a 5 card hand drawn from you deck, and get 1 Action and 1 Buy to use. The Actions come from the Kingdom cards, so the first time through your deck, you don�t get to use any. Treasure cards in your hand can be spent on any card from the supply, which vary in cost from free for a Copper card to 8 for a Province. You will generally spend your first 2 turns buying either Treasure cards or Action cards, placing them in your discard pile as you do. If you ever need to draw a card from your deck and there are none left, you simply shuffle your discard pile (with your shiny new purchases in it) and that becomes your deck. Action cards generally allow you draw extra cards from your deck into your hand, play additional actions, buy extra cards, and add to your Treasure for the turn. Many of them allow, or sometimes force, more complex things to happen. Cellar allows you discard cards from your hand in exchange for cards from your deck, The Adventurer goes through your deck hunting down more treasure. There are also Action-Attack cards, that can be used to upset your opponents and scupper their plans. Thief steals their Treasure, Spy give you some control over their next card draw and the Witch forces Curses upon them. The game ends when the Province stack runs out or any three decks run out and victory goes to the player who has managed to amass the greatest number of Victory Points. This causes a few headaches during the game as the otherwise useless VP cards start to clog up your deck and your hand. Drawing a handful of VP cards can mean you doing nothing on your turn, except maybe �buying� a Copper. The variety of card sets and the strategies that be built using them are vast and varied. Once you have the hang of the games finer details games can take anything from 15 to 45 minutes, depending mostly on the options available, so a session can run to many games, each of them different. The card quality is very good, but if you are going to be playing this one much (and I�m sure you will!) I recommend sleeving your cards, as within a week of getting this game (30+ plays) some of the copper cards were starting to show some wear. I�d suggest getting hold of Euro sized sleeves that will fit the card perfectly, as larger sleeves will not fit in the supplied storage tray. The game plays brilliantly with 2, 3 or 4 players, more players does slightly extend the playing time of games, but playing a Thief is much more satisfying when you are stealing Treasure from 3 opponents rather just the one! At the time of writing there are three expansions (two big box and one small box) available as well as three promo cards in circulation with a further big box planned for Autumn 2010. All are worthy additions to the game that add much to it, but the base set plays fine on it�s own and is not �fixed� by any of them. The Intrigue expansion adds rules for 5 and 6 player games and 8 player, 2 table games. After 2 months of owning this game, it is still the most regular visitor to our table, and we are still developing new strategies and discovering new card combos. Excellent game, I�d recommend to anyone. You only play with 10 Decks of cards, which means there is a lot of potential combinations available and the rule book has suggested scenarios to play out. You also have a randomiser deck which has one of each type of card allowing you to draw the 10 decks at random. You all start off with the same hand of cards and each turn you have a hand of 5 cards you use to play an action card (if you have one and if you want to play it) and follow its effects then buy a card from one of the piles, these can be higher value money cards, action cards or Victory Point cards. You use various combinations of action and money to buy a hand of cards that allow you to buy higher value VP cards or specials that give you VP's based on (for example the number of cards in your hand). The aim is to have the most VP's at the end of the game to win. However the trick is balancing the VP cards which have no other use (except in combination with some action cards) and the action/money cards. There are some cards that effect other players, some defensive cards etc. Each game is unique as it depends on what cards are available, the end game is triggered when 3 decks are exhausted or the province cards run out. This game plays quite quickly, is very easy to pick up and you always want to play another game. It is just FUN!! I recommend this to anyone for their collection. This is one of the best games to come out of Essen 2008. You get 500 cards for your money, but in each game only 10 decks of these cards are used and the way each type of card interacts with the other card types is what makes this game so interesting. Basically, this is a card drafting game, where you start with 10 cards in your deck then use these cards 5 at atime to buy more cards so that as the game progresses you increase the size of your deck using the abilities on the cards. In this way, you collect cards to get more cards, the game ending when either the supply of Province cards is empty or any 3 supply piles are empty. Then, whoever has the most Victory points wins. This is a really clever hand management game. It plays quickly, is easy to learn and most important of all it's FUN! !